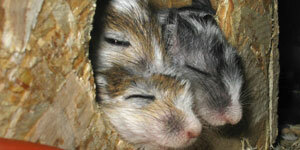 Hello and welcome to TheGerbils.com! 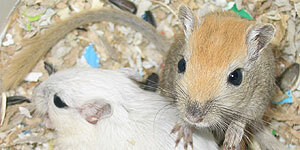 Here, you will find information on gerbil maintenance, reproduction, gerbil genetics and on many other interesting subjects! 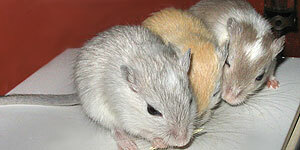 I'm a gerbil breeder located in Quebec, Canada and I have completly fallen in love with those funny little critters! This site is a long term project so, it’s constantly under construction! Your questions and comments fuel my brain and give me ideas for new pages and updates. Everyday, I work towards making this site more complete. Don't hesitate to send me your comments as well as your questions. This website is here to assist you! I hope you'll enjoy it! The gerbil is a very nice little rodent. They are as interesting to watch as your T.V.! They interact with each other by playing, boxing, jumping, chewing and climbing. The gerbil is a totally different animal. Their bushy tails make them more appealing to most people who don’t like rat or mouse tail. It's the perfect small pet! They are not nervous about frequent handling and won't be sad if left alone if they are in pair. The gerbil being a desert animal, they produce very few feces and urine. The cleaning tasks are then very easy. They will never have the smell that hamsters, rats or mice can have. Not at all! They are active when it moves around them. They are aware of your every movement and come to see you when you pass by. They are totally friendly with kids and also older ones! They bit only if we hurt them or if we manipulate them to roughly. But even that, they are very patient. 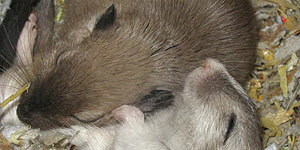 In a matter of fact, gerbils have to be kept in pair. In group of 2 to 4 they will live happy for 3 to 5 years. Loneliness makes them apprehensive and even aggressive.